Whether you are moving to Luxembourg from another country or simply moving houses within the Grand Duchy, read our #101guide to get the answer to your FAQ – Finally all your need to know, in one place. What fast speed connections are there to Luxembourg? How well is the airport connected to international destinations? How do I get to the airport (Findel)? Does IKEA deliver to Luxembourg? Do they also assemble the furniture? Are there any other cheap furniture places around Luxembourg city? Where should you register in Luxembourg as a new arrival? How to get electricity sorted out for your residence? How to get a phone line for your place? How to get internet installed? Where can I go food shopping? What places to go to for organic food shopping? What bakery would you recommend? What languages are most useful in Luxembourg ? Is it possible to get by with English only? What language school would you recommend? What mobile phone companies operate in Luxembourg? Where can you get a car registration plate? Is it possible to park in the city for free? How does recycling work in Luxembourg? Where do you get the blue recycling bags? What can one put into the blue bag? When is my collection date for the blue bag? How can I recycle old batteries? IX) What national holidays and days off are there in Luxembourg? What national days off are there in Luxembourg? 1. How to get around the city? Public transport in Luxembourg is fairly good. The bus is probably the easiest and fastest way to get through Luxembourg city. 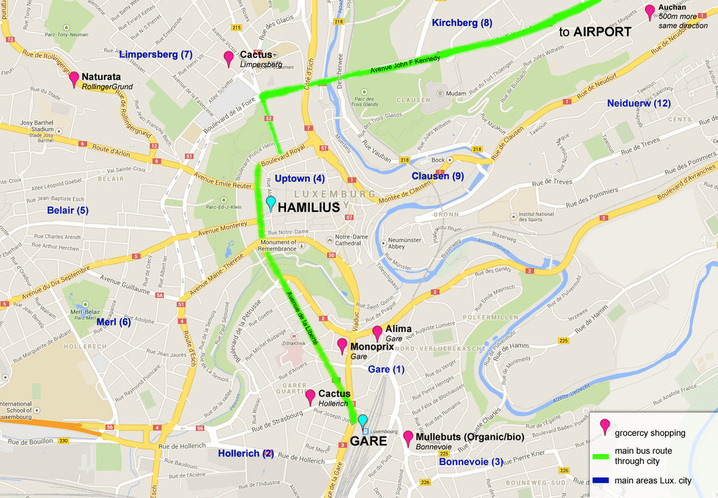 There are two main hubs through which most of the buses are going: They start at Gare and from there go to Hamilius. This is THE main route, and many buses from there go to Kirchberg. 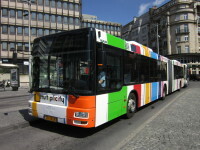 In fact, no 16, one of the main bus lines, goes from Gare to Hamilius and then through Kirchberg to the airport.We also highly recommend www.mobiliteit.lu or to call 2465 2465 to get free information on public transport and how to get around as well as how to plan your journey. They are both fast and efficient. Luxembourgians and many frontaliers are very fond of their car. Luxembourg city is a commuter capital and a large percentage of the daily workforce commutes across the French and Belgian borders into Luxembourg and of course returns in the evening. As a result you have regular traffick jams from 4 o’clock onwards in the afternoon if you are going back to Belgium on the E25. Take this into account if you would like to go to IKEA which is directly behind the Luxembourg border on the Belgian side. It means that your journey will be about 30 or 40 minutes longer than usual. 2. What fast speed (train) connections are there from Luxembourg? 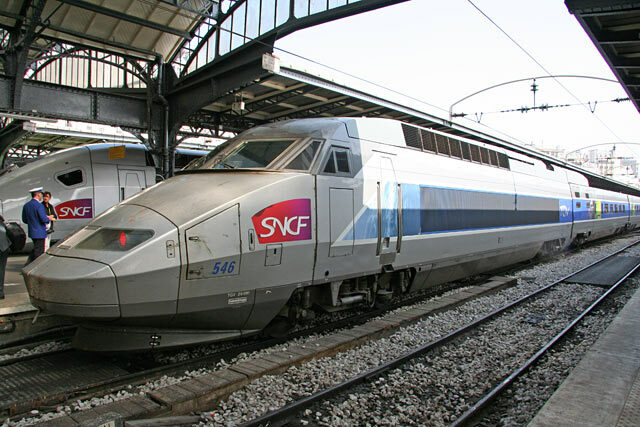 The Gare gives you directly access to a fast speed train to Paris that takes about 2h and 15min and arrives directly within the French capital. The train is very popular and early booking are highly advisable if you want to avoid over-priced tickets. We frequently use this service and it’s fast, reliable and a great way for a quick city trip. 3. How well is the airport (Findel) connected to international destinations? The airport is fairly well connected internationally considering that there are 2 main airport hubs right next to Luxemboug with Frankfurt Main and Paris Charles de Gaules. It is worth pointing out that Luxembourg is very well connected to London and there are frequently flights, about 8 or 9 a day to the British capital. Easyjet also recently touched base in Luxembourg and they offer daily and cheap flights to London and Milan. Both are very popular and we’d suggest that you book tickets early to get a good rate. Besides Easyjet also Luxair, the national airline is flying frequently to London as well as British airways. Luxair also flies to numerous other destinations across Europe. Turkish airlines also offer a direct flight to Istanbul that has been very popular and overall there are good connections to most other European cities. 4. How to get to the airport (Findel)? One of the easiest and most cost effective ways to get to the airport from Gare is to take the number 16 bus, which goes to Hamilius, Kirchberg and then to the airport. Overall journey time from Gare to the airport is about 20-25mins. However it’s safer to plan with about 30min from Gare to the airport, as you need to consider heavier traffic, particularly between 4-7 o’clock in the afternoon. The bus stops frequently but make sure to check the main bus stops along its route, as it does not stop at every bus stop. However it does stop on average every 300-400 meters, so it’s quick to walk to the next bus stop and buses on average arrive every 10 minutes. Currently there is no train connection to the airport. Annoying, we know, but that’s the way it is. There are plans to connect the airport via tram but this is a hotly debated topic in Luxembourg. We are of course strongly pro-tram and can’t wait for it to be finally built! Until fairly recently, taxis in Luxembourg have been really expensive and unless you had any other option, we would not have recommended them. However, there are new additions to the market. One of them is Webtaxi which offers a decent and reliable service. They use a really good tracking system that sends you text messages when your cab is on its way with details where exactly it is at that moment in time. They are also about 10-15% cheaper than the other companies which makes this a really good option. Booking is fast and convenient through their website or app. 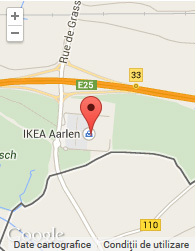 Ikea is very close to the Luxembourg border in the direction of Capellen. Most people organize a shared lift with the car to get there. This is probably also the best way to go as the motorway passes IKEA within 200 meters. There are some people that have tried to use the train to Kleinbettingen (the closest train station on the Luxembourgian side) and then walk across from there to IKEA. However this is not really advisable as the walk from the train station to IKEA takes about 20-25min and trains are not going frequently. As a result, going by car is probably best. 2. Does IKEA deliver to Luxembourg? Yes they do, however you need to pay for it. Directly inside IKEA, after you passed the tills, on the right side in the main hall towards the exit there is a delivery service. Prices are about 50 euros to have stuff delivered but of course everything depends on quantity. 3. Does IKEA also assemble the furniture? As far as we are aware they do not assemble the furniture. Please message, we love to stand corrected. 4. Are there any other cheap furniture places around? One of the places that we like within Luxembourg city is Troc (www.troc.com/lu/). It’s a second-hand furniture store in Hollerich and they also have another store in Esch/Alzette. Sometimes you can get lucky and get some really good furniture for very little money. 1. Where should you register in Luxembourg as a new arrival? Once you have moved into your new appartment you should get yourself registered with the `Bierger zenter’. This has several advantages, most of all you might get a parking permit that allows you to park within the city anywhere for two hours for free. This is a handy advantage particularly in a city that is notoriously short on parking spaces. 2. How to get electricity sorted out for your residence? You need to register with Leo. Prices for electricity are very reasonable. Leo also offers for a small fee a mix of energy that is based solely on renewable energy sources. 3. How to get a phone line for your place ? Normally you would get your phone line through PT Luxembourg. If you want to get a house telephone for your new flat or house, it is really useful to know that you will probably have to wait for about 3 to 4 weeks. We know this sounds pretty incredible but this apparently is the amount of time that PT Luxembourg’s technicans take before they manage to come round to your place due to high demand or understaffing…we don’t know. On the other hand PT’s website is pretty good though and offers a host of services. 4. How to get internet installed? You can get your flat connected to the internet through a number of companies. The most common ones are PT Luxembourg, Tango, Luxembourg Online, Visual Online or Electrona. However, you will need to prepare yourself for a 2 to 3 weeks wait before the technicians are able to connect you! All competitors of PT who offer internet as well still depend on PT to install the line first. 1. Where can I go food shopping? There are several bigger supermarkets around Luxembourg city. There is `La Belle Etoile’ in Strassen and Cora inside City Concorde in Bertrange or Cactus in Howald. The most accessible by bus is probably Auchan in Kirchberg. Busline 16 from Gare or Hamilius. There are several small city supermarkets such as Monoprix, Alima, Delhaize and Cactus in Gare, or Cactus in Limpersberg for instance and then there is also an Alima very central close to H&M in `la grand rue’, the main shopping street in uptown. 2. Where to go for organic food shopping? Most of the bigger supermarkets have an organic food section. Even so, a more specialized place to get great organic food is Mullebutz in Bonnevoie. 3. What bakery would you recommend? One of the best places to get outstanding treats is Oberweis. They have an excellent bakery and their food is a treat. Their flagship store is in the grand rue. They are also a great place to pick up a treat for friends. Traditionally also a really good bakery is Paul’s, who are right at the Place d’Armes. 1. What languages are most useful in Luxembourg? The main languages to get by in Luxembourg are English, French, German and Luxembourgish. The official state languages are French, German and Luxembourgish. The capital is a plurilingual hub and you might be surprised by how many languages the average resident speaks. It is fairly common to be at least tri – if not quadrilingual. In fact many school kids tend to be pentalingual. The most useful languages for work are probably English and French. Some work places require English only but there is usually the requirement to speak French and in some cases German. This is a necessity to be aware of. While it it possible to get by with just English, it normally really helps if you have at least a basic notion of French as there are many French-speaking frontaliers that work in the service industry. Of course speaking Luxembourgish represents an important advantage as it really helps to get things sorted out a little quicker and the locals like if you make an effort to learn their language. However, it is perfectly possibly to get by with just English and perhaps a little French. 2. Is it possible to get by with English only? While it it possible to get by with just English, it normally really helps if you have at least a basic notion of French as there are many French-speaking frontaliers that work in the service industry. For additional information please do read the previous section about the most useful languages in Luxembourg. 3. What language school would you recommend? The ‘Institut National des Langues’, located right next to the Glacis, is by far the cheapest way to learn a new language in Luxembourg. However, registering for a course and then getting yourself onto one of the classes is a different matter. Courses tend to be very popular and strangely enough the registration for a new course is in French only. This brings about the unfamiliar situation where you have to fill in an application form in the very language you might try to learn. It does require some patience as you will probably have to call them or get some help from a French speaker. Despite these shortcomings, it is worth to investigate this option further just because the classes are that much cheaper than the other language schools (about one fourth of the price!). There are also registration deadlines that you should be aware of, and generally speaking you need to be well ahead of time to secure a space in one of the classes. Although most jobs will require you to be fluent in English, there are also many jobs that need French as a second working language or in some cases also German. Therefore it can be a really good idea to learn French once you arrive in Luxembourg. Having said that, there are many people that do not speak a word of French at all and live perfectly fine without it. Generally speaking the everyday jobs in shops and restaurants all tend to be French speakers with limited knowledge of English. They set the tone at times with a refusal to learn English. Pro Lingua offers a full immerse teaching method, which means that they focus heavily on speaking and getting you going in French and therefore only speak French and rarely use for example English as vehicle language to teach you. This method has both advantages and disadvantages and follows the current didactic trend on prioratizing speaking. Nevertheless, we cannot help but feel that this has the severe disadvantage that the basic grammar and vocabulary are not taught properly. If you are following a three month regular course, you can expect to pay somewhere around 400 euro. hand experience of the quality of the course. Please feel free to send us any feedback. 1. What mobile phone companies are there? There are four main companies in the market. They all offer mobile phone packages that are very similarly priced, however they all have a few strengths and potential weaknesses. The market leader offers one of the best networks with solid, good connectivity. They have a comprehensive offer of services from mobile phones to TV programmes and internet packages. Generally they tend to be a little bit more expensive than the competition, however they also overall have a better network which is relevant for mobile phones. They were also the last company to introduce 4G but have been quick to catch up over the course of the last few months. Orange has been in Luxembourg for about 10 years now. They have more competitive rates on international calls. This is also one of their key strength. However, their network coverage is not as good as PT’s. Tango is arguably the cheapest mobile phone operator in Luxembourg. It is surprising that all main mobile phone operators offer their standard mobile phone package at about 50 euros for unlimited calls and internet usage. From that point of view, the mobile phone market could do with a bit more competition. Even so, Tango has a slightly more competitive package and it is possible to negotiate some add-ons with them. For example you can perhaps have the first 6 months at a discounted rate or have 4G directly installed without any further price upgrade to your package. Tango has three main stores within the centre of Luxembourg. One is within Auchan Kirchberg, the other two are at the Gare area (2A rue Origer /2269 Luxembourg) and uptown (3 rue Philippe II/2340 Luxembourg). Tango’s customer service is okay, so is Orange’s and PT’s. One of the latest companies in the market is Join. Interestingly enough, they do not charge for international calls and do not have roaming charges. Their plans are directly laid out for people who by default call across Europe. Very handy indeed for many of us. However, at this moment in time, none of our team are on Join. Any feedback you have from your experience with them is much appreciated. 1. Where can I get a new car registration plate ? Your main SNCT station for Luxembourg city is in Sandweiler. 2. Is it possible to park in the city for free? You can park within Luxembourg city for two hours for free, if you have a residence `vignette’ which you display in your windscreen. This `vignette’ is available for all Luxembourg city residents and you can get it at your local Bierger Zenter. 1. How does recycling work in Luxembourg? Luxembourg is one of the leaders in waste collection and recycling. One of the main companies is called ValorLux. Feel free to browse around their website for loads of information about recycling and waste prevention. 2. Where do you get the blue recycling bags? We could not explain it better than Valour Lux. 3. What can we put into the blue bag? 4.When is my collection date for the blue bag? 5. How can I recycle old batteries? There are numerous collection points for old batteries often in mobile phone shops or the supermarkets. SuperDreckskescht, which translates as `super waste bin’, is an award-winning recycling and waste management program from for businesses and individual household. The programme has also been recognized by the European Union and has received the prestigious `best practice’ award and exported to other countries such as Switzerland. There are numerous initiatives with SuperDreckskescht, from recycling batteries to coming to collect dangerous waste from your home about 4 times a year. 1. What are the key days off in Luxembourg? 23rd June – the Grand Duke’s birthday. On the 22nd, the eve of the Grand Duke’s birthday the whole country, and in particular Luxembourg city has one of the biggest parties of the year with massive fireworks and loads of festivities and parties all over the city. It is a day not to be missed and undoubtedly the day to party in Lux. Relocation Guide To Luxembourg. Hi Ester, we have already replied to you via email. Feel free to have a look at http://www.vaubanfort.lu (flatshare agency in the capital) who are also our partners. They generally have really good flatshares in the city centre.